Mark Bradford (b. 1961) has solidified his position as a household name among art-going audiences in recent years. In the summer of 2017, the artist represented the United States at the American Pavilion during the Venice Biennale. Later that year, the Smithsonian Institution’s Hirshhorn Museum and Sculpture Garden opened an epic installation that runs until 2021. Titled Mark Bradford: Pickett’s Charge, the installation presents Bradford’s signature collage technique and highlights his penchant for oblique commentary on history, geography, and politics at a time when such discursive sites seem increasingly charged and contentious. 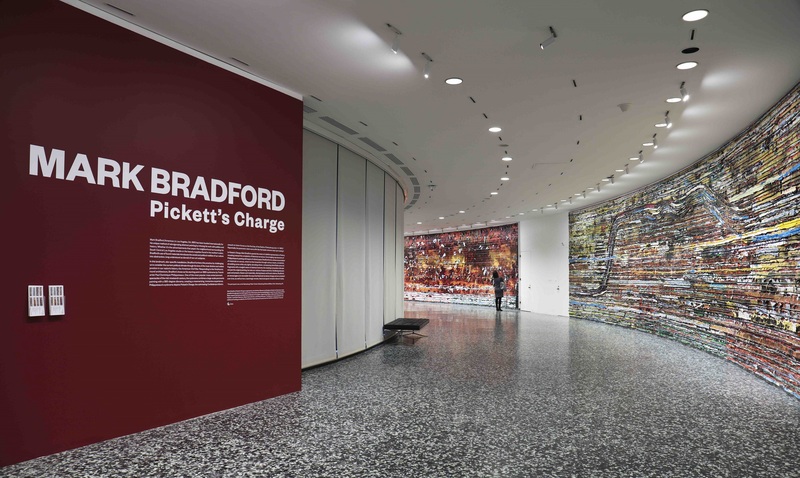 For Pickett’s Charge, Bradford created eight large-scale panels, each twelve feet high and forty-five to fifty feet in length; the installation is a site-specific work that enters into a conversation with the Hirshhorn’s elevated, open cylinder structure (fig. 1). The work is based on Paul Dominique Philippoteaux’s (1846–1923) nineteenth-century Gettysburg Cyclorama (1883; Gettysburg National Military Park) depicting the pivotal moment in the Civil War battle when Confederate general George E. Pickett led a failed offensive against Union forces. For viewers traveling to the Hirshhorn Museum’s central location on the Washington Mall, in close proximity to the sites of so many recent political battles, Bradford’s installation presents a tongue-in-cheek interrogation of history, vision, and truth in the context of another critical crossroads in American history. Bradford paints using a process of collage in which he builds layers of bright, vibrant pigmented paper, appropriated street posters, and other materials that are then manipulated through sanding, scoring, and tearing. Art historian Huey Copeland described Bradford’s compositions as suggesting “the historical, the cartographic, and the architectural while remaining resolutely abstract.”1 In Pickett’s Charge, the deep layers of colored paper are structured by lines of bungee cord or rope buried in the strata of color and material. They mostly run in regularly spaced bands parallel to the floor, although at times the regularity of these striations are broken as they swirl and wave across the canvas. The ropes are often pulled from their bedding in the canvas to reveal the layers of color below or to hang from the wall in messy, paper-coated tentacles. The deep troughs left by removed rope highlight the archeological nature of the work that sometimes invokes the peeling layers of postings and concert announcements on city streets, or neglected billboards. The work is recalcitrantly material, yet it contains moments of discernable imagery in the form of enlarged reproductions of Philippoteaux’s cyclorama, a scene only just discernable through the rips and seams of paper and rope. Instead of producing direct photographs of the painted cyclorama, Bradford culled these images from the internet and enlarged them to billboard-sized prints. The source images were apparently photographed from books, as the process of enlargement has exaggerated the overlapping Ben-Day dots from the CMYK printing process. These stages of mediation and manipulation, which Bradford does little to hide, add another layer of abstraction to the images in Pickett’s Charge. Capitalizing on the unique architecture of the Hirshhorn Museum, Bradford adapts the cyclorama format for the twenty-first century in Pickett’s Charge. The massive yet intimate compositions cover the entire curving wall along the inner gallery of the third floor of the donut-shaped building, broken periodically by doorways into other galleries. The opposite wall of glass looks into the inner courtyard of the building. Given the plan of the Hirshhorn Museum, viewers cannot stand in the center of the installation to have one all-encompassing view of the work. The visual techniques of the cyclorama are thus disrupted. Of course, I could not help but imagine how, if the sheath of window shades were not lowered (which they were in my visits), one could look across the inner courtyard to Bradford’s work on the opposite side. Frustrated by the difficulty of this view, visitors must inevitably turn back to the work and, comparatively pressed against the canvas, they must move in either direction to follow the canvas curving out of view. It is therefore no coincidence that curator Evelyn C. Hankins opens her catalogue essay on Pickett’s Charge with a quote from the theorist.4 Of course, Benjamin’s analysis probed Paris in the nineteenth century, and one must remain cognizant of how Philippoteaux applied the panorama as one tool in another struggle for mastery that was underway in America after the Civil War: that of overcoming the trauma of the Civil War and of writing the American narrative. Narrating the Civil War was a hugely important project just beginning to gain steam in the United Sates in the last two decades of the nineteenth century. This is reflected in other cultural productions, such as the increasing manufacture of Confederate monuments (plans for Richmond Virginia’s Monument Avenue were begun in the 1880s, and the famous Robert E. Lee monument was unveiled in 1890).5 Philippoteaux’s cyclorama presents the bloodiest moment of Civil War history as a frozen and controllable panorama—visitors witness but are never threatened by its unfolding chaos. The cyclorama in this respect was a technology of control over the world and over history. Yet there is no controlling history in Bradford’s Pickett’s Charge. There is literally no stage for the centered subject and the masterful sort of viewer imagined by the nineteenth-century cycloramas. Bradford’s compositions do contain a few moments when images of the scene borrowed from Philippoteaux cohere; in these instances, one discerns representations of a haystack, pixilated soldiers armed and charging, or a pair of horsemen observing the battle. Still, these are brief glimpses of recognizable things, tentatively viewed through the striations of rope. At no time does one get the sense of the scene as a frozen moment in history. We are instead thrust into the event as layered, obscured, and impossibly mediated. These layers become the source of the work’s abstraction, and rather than using techniques to hide the illusion, viewers are confronted by the materiality of the work. Bradford’s abstraction is phenomenological, and one almost feels immersed in its materiality as the work literally peels off the wall into the viewer’s space. If history is a central theme of Pickett’s Charge, it is presented as the chaos of an all-encompassing process unfolding before us in physical form rather than in representation. Resolutely anti-monumental, Bradford presents us with history in the twenty-first century. One provoking surprise for those looking closely is the fact that the informational handouts provided by the Hirshhorn Museum do not exactly coincide with the works on the walls. The haystack in the panel titled Dead Horse, for example, appeared significantly deteriorated in person, more so than in the illustrated materials. Clearly, the artist made adjustments sometime between the documentation of the work and its final installation—yet another example of the performative and improvisational aspect of Bradford’s process. But in my visits, I could not help but muse on the possibility of overzealous viewers pulling at the work. I was not alone in noticing the handout images as yet another divide between representation and reality in the exhibition. Recently, I had a conversation with a new acquaintance who had seen the exhibition and found the disparity somewhat unnerving. For her, the degrading haystack introduced a question of when or whether the work is complete. Yet, in the end, we agreed that this evolving and unstable nature highlighted by the draping rope held exciting potential in its presentation of Pickett’s Charge. It perhaps suggested yet another way in which to critically alert viewers to the illusory representational techniques of Philippoteaux’s frozen battle scene. Pickett’s Charge insists that history is never complete. Without a doubt, the layers of interpretation produced by Philippoteaux and its various mediations inform our own embodied present. Today Americans live in times that are perhaps as confusing, chaotic, and fraught as they ever have been, and it is this condition that Pickett’s Charge seems driven to illustrate. 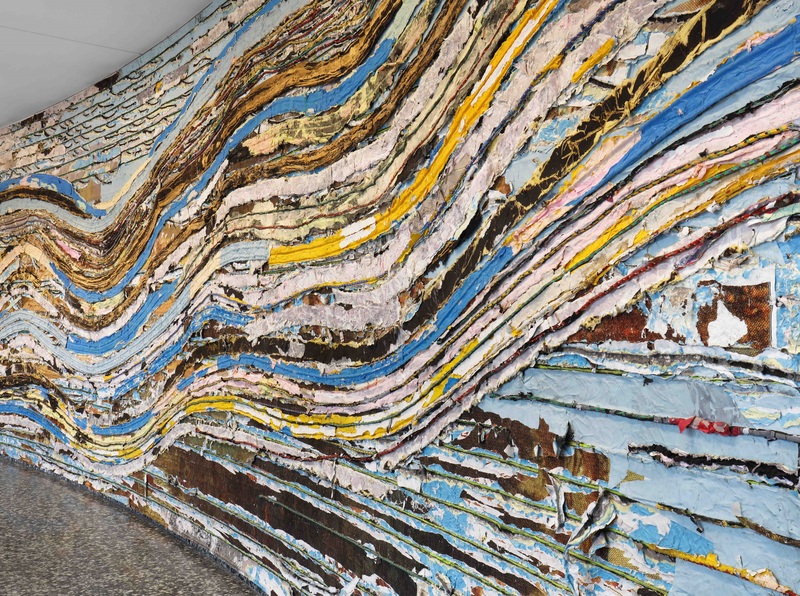 Cite this article: Tobias Wofford, review of Mark Bradford: Pickett’s Charge, Hirshhorn Museum and Sculpture Garden, Panorama: Journal of the Association of Historians of American Art 4, no. 2 (Fall 2018), https://doi.org/10.24926/24716839.1682.